Feel blessed as you step in to one of the most sacred cities on the Island. Kandy being an ancient Kingdom still holds its pride along as it welcomes guests. 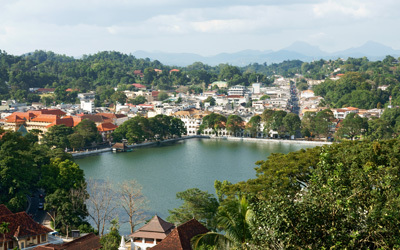 Kandy which is located in the central province is also considered as the second largest city on the Island. City of Kandy beholds many historical beliefs and values passed on from generations and leads to many places of attractions in this regard. Surrounded by hills; city of Kandy is enriched with unmatched beauty and elegance. Known best as the “Sri Dalada Maligawa” by the citizens of the country, is a remarkable religious place which attracts followers and visitors from across the world. The temple which was once the Royal Palace during the Kandyan Kingdom is designed with gold interiors and rooves. The temple holds the most important tooth relic of Lord Buddha in a Golden Casket with all due respect. Apart from the main shrine in the complex, visitors also have access to other temples, new palace, audience hall and the Buddhist museum with many learning materials. They call it an incomplete journey to Kandy without a visit to the Botanical gardens. The first tea seedling was done in the garden in 1821 which was also the year of formal opening of the garden. With an area of 150 acres, the extension of flora and fauna throughout the acres is Undoubted and an eye catching view to many visitors. Out of all floral plantations, more than 110 endemic plants spread over the garden. With the increase in demand for more and more shopping with the increased percentage of tourism, Kandy gave birth to an exclusive and grand city center. The city center which is a classy shopping mall let’s all visitors to Kandy a great shopping experience with varieties of best boutiques in Sri Lanka which offers clothing, shoes, accessories, toys, jewellery, food and beverages, entertainment, souvenirs and many more. The remarkable museum of Kandy which is built in accordance with the ancient ambience of the Kandyan Kingdom truly adds royalty to the museum. The objects belonging to the museum is a collection from the Kandyan kingdom during 17-19 AD. The many divisions of the museum include, cultural, science, general and library. The opening hours of the museum is set to be between 9 am to 5 pm from Tuesday to Saturday. The temple of Embekka is dedicated to God Kataragama who is believed to be very powerful. The temple can be viewed as the best temple with the finest wood carvings. During the regime of Gampola in 1370, King Wickramabahu 11 who was the ruling king at the time built the temple of Embekka as a token of tribute to God Kataragama. Situated in Pilimathalawa, the temple of Gadaladeniya is being captured as an incredible architectural site of stone carvings. Supported by a huge stone slabbed roof on two large stone pillars makes the entrance to guests a wonderful memory. The temple was built in the 14th Century by master craftsmen who were also genius in the religion of Buddhism which lead to the successful completion of the temple which is now a major tourist attraction when travelling to Kandy. The temple of magnificence and in depth architecture which belongs to the Gampola Kingdom paves the way to a history one wouldn’t have plastered in books. King Buwanekabahu the 4th was honored in constructing this temple during his reign of 1341 to 1351 AD. Temple of Lankathilaka stands in extraordinary pride in terms of its structure and design. Some of the noticeable attractions within the premises include, the well-designed preaching hall, main temple with plastered granite covering, natural rock constructions with wall paintings, paintings of the two large lions and 12 foot high Lord Buddha image giving the temple ultimate serene. Apart from the above, other attractions in and around Kandy include, Knuckles Mountain Range, Kadugannawa gap, Lake of Kandy and Udawatta Kele Sanctuary. Kandy is truly a relaxing holiday destination anyone would crave for. Make the most of it and enjoy!